There are several versions of this story going around. Here’s my donkey tale. 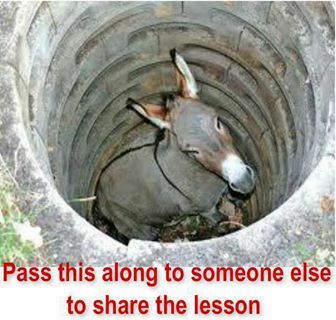 One day a farmer’s donkey fell into a well. The animal cried piteously for hours as the farmer tried to figure out what to do. Finally, he decided to share his problem with his neighbors. They all gathered around the well and stared at the poor, braying donkey. One-by-one, the neighbors offered solutions – some good, some bad – for getting the animal out. The farmer listened to their ideas, and then choose the one he thought would work the best. He and his friends formed a water bucket brigade. With each bucket of water they poured into the well, the donkey floated upward until he was able to step out. The farmer thanked his neighbors and they left with a feeling of good cheer that they had helped save the animal. Sometimes our troubles seem so deeply buried in a well that we can’t see a solution, but help is within our reach if we just ask. Don’t hide your problems and let them go from bad to worse. Seek help from those around you. Decide what’s best for your situation, and then work diligently on the solution. Let others feel good for offering their advice. What do you do when life dumps you in a hole? Please leave a comment. If you like this blog, click “follow” on the sidebar and receive notifications of new posts by email.